Living and working in a tiny space certainly has its challenges, but there are some tricks for maximising space. Some design projects require quite a bit of table area for work in progress and project support material. As I also have several projects on the go at any one time, I often have a work spread which has to be stored until the next time I continue work on it. For the various project spreads I made a number of hardboard trays and a rack to hold them, which more than doubles desk surface area, whilst allowing the trays to be stored away neatly when not in use. But any one project in progress still requires more working space than my desk provided, and I also wanted a work station I could easily move outside when the weather allows me to work in the garden. A kind of easel would be the answer. An image google search provided me with plenty of inspiration, and a look around the shed yielded a few pieces of suitable wood. The easel-come-work-station is designed to be as versatile as possible, allowing different height settings for different chairs, and many different use configurations. The boxy frame has grooves cut into the inside surface to take a couple of project trays, and another one below the ledge for vertical boards can be used for a small tool tray or for an extra board. The back of the frame has a slat at the same level as the ledge, and together they can hold a board or large book horizontally, if no vertical board is in use. The top of the frame can be used as a shelf, and the cross member at the back can support a large book resting on the tray, and with a strip of steel cut from a 5 gallon can and a strip of plastic attached to this member, it can be used as a magnet board and sticky note support when a full magnet board is not required. The table board just hooks onto the frame and is supported in the front by hinged struts. This board is the same depth as the width of the project boards and can be slid into the groove below the ledge to hold it horizontally, though it is not very strong that way. Fine for a layout, but no good for elbow support! This board has a thin wooden edge on the left and front at right angle to be used as a square edge for drafting. The front edge also stops things slipping off. The board at the base holds the front and rear frame at a fixed distance when hooked over the front (it is hinged at the back) and can be used as a shelf for a file box or other stuff, or as a foot stool when using the comfy chair. The bottom front strut makes a good foot rest when using the desk chair. And the whole thing is on castors for easy moving. The castors have brakes to hold it firm in use. 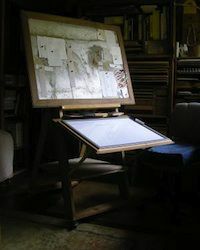 And when not in use the easel folds flat (ish), and can also be carried with easy due to its light weight. As an aside about the comfy chair, it is one of the garden chair world's best kept secrets. An image google for a reclining chair yielded some carp fishing chairs. Like some types of garden chairs the reclining models can recline all the way back, but can do so without arm rests, as the mechanism is a toothed wheel which engages at different positions when released and tightened (dog clutch, http://www.buyapress.co.uk/New_Parts.html similar to third from bottom - sorry, link now dead), which means no arm rest to get in the way when working. The legs are telescopic and can be adjusted to the terrain individually, and a wide swivel foot prevents sinking into soft ground. The seat is padded and suspended on bungee cords, thus very comfortable. It has made a big difference to my creaky back and hips. Well worth the money. Mine is made by JRC, and I got it from one of the cheapest suppliers in the UK (and fast) that I could find online. Here is a link to a similar chair from the same vendor (internet archive link) as my model is not shown on the website. Mine was a little cheaper. If you are wondering why such comfy chairs are particularly made for carp angling, I am told it is because carp often requires a very long time sitting around. They even make carp tents and beds! The photos are fairly self-explanatory, so I'll just add a few extra points. The easel is very simply put together with basic wood working tools. Any joining was done with screws and hinges. The grooves were simply cut with two closely spaced saw cuts, and the thin ridge broken out with the twist of the saw (only if a stiff saw is used). To get the top and bottom angle of the side pieces (and the parallel grooves) I laid them on the floor with the back legs in position and spread to the desired distance, which was roughly determined by the ply board I had for the base. A line across the bottom established the angle, and the top was just cut parallel to the base. The boxy frame is virtually self-bracing. The ply board is hinged at the back and rests on a thin strut at the front, and is prevented from sliding back and forth by two thin strips of wood screwed to the underside, forming a lip in the front and one to go behind the strut. The board at the bottom of the back frame is screwed into the back legs and also secured with small angle brackets, as the legs are a little thin and can only take one screw from the base. The table board has a thin strut glued and pinned to the underside at the back to form a lip which hooks over the metal cup hooks, and also gives the board a little extra rigidity (together with the straight edge on the top). There are two sets of hooks for different chairs. The angle of the board can also be changed by inserting the diagonal struts from the table board into different holes on the front of the frame. Those struts are hinged on a block of wood on the underside of the board, and have a pin at the other end to insert into any of the drilled holes. All the wood strips on the board are set in from the edge so that the board can be slipped into the grooves. Hardboard is fairly tough material, but the edges can get a little frayed, and particularly the corners. To keep the corners a little more crisp I applied some PVA glue to them and just let it dry on the surface, compressed with the aid of some strong clamps. The one thing which has really bugged me about the easel was the table support, which was fixed to the board and not the easel. It was a quick job, but not very strong, and above all, it always got in the way when I wanted to use the board on my lap or just move it somewhere else. Adjusting the height was also awkward. I screwed together a simple frame with 2" x 1" battens and attached it to the uprights with bolts in one of three height settings. The diagonal support is made of thinner strips and hinged to the frame with mirror plates at the front and bolted to the uprights, again through holes in different positions to allow for various angles. If I would have had the equipment or patience to do it, I would have (and may still) cut grooves in those diagonals to allow for faster and unlimited adjustment by just loosening a winged nut and moving the frame to the desired angle, then tighten again. Another change I made to the easel can be seen in the above picture. I lowered the shelf board where it offers more storage space and is easier to use as a foot rest with high or low chair. As the board was a little to short for the lower position, I connected the legs with two slats and rest the board on top of them. The slats are held in place with nails as pegs, i.e. holes are pre-drilled slightly larger and the nails just dropped in. At the back they are hinged to the frame. Another advantage of attaching the support frame to the easel is more flexibility. I can slip the board in side-ways for a smaller surface, or I can use the support for other boards, like the project boards. To clip paper to the board I added a piece of clear plastic, held with a binding clip/spine. The clear plastic is tight enough to hold paper, whilst the edge is loose enough to easily slip the paper underneath. To make it easier to slip paper under the edge of the plastic, and do it one-handed, I creased the edge by running a paper folding tool (or any semi-blunt object like an empty ballpoint pen) about 3 mm from the edge with a few layers of paper or some thin card underneath. This makes the edge fold up. These plastic clips can be attached all along the free edges. I also strengthened the board by adding more wood strips to the underside, some of which are in the position where the board rests on the support frame. The beading is glued and pinned. The edge with no beading on the underside has a bead on the top which is part of the "set square". The board is held to the frame with nail "pegs" and at the back by the notch seen in the second photo of this update. The notch prevents the board tipping down in the front. The bottom part of the notch is for the board when the frame is angled down in the drawing position. It is not holding the edge as in the horizontal position, just giving it space because the pegs hold the board in position where the back edge would come into contact with the uprights.